Is it giving the public what they want, or an insult to a work of art and a cultures intelligence? Is it fanfiction, or a bandwagon that production companies jump on, to cash in while something’s popular? At the risk of this turning into a rant from the start, I want to explain what this article’s about. Because yes, everything is copied and little is truly original any more. There are adaptions, translations, and dubs. This article is about remakes (if you couldn’t tell from the title :P), why they occur, and why we as fans have the volatile reactions we have whenever one is announced. And I will attempt to not turn into Ranty McRant. Attempt. Not all remakes are bad. Some are genuinely made with love or respect – and so end up being wonderful nods to the originals (such as Peter Jackson’s King Kong re-imagining – a homage to the 1930’s classic that lead him to pursue his film-making career). But I want to study a trend, a particular type of remake that I’m sure you’re familiar with. Each time one of these announced they are accompanied by a flurry of online woe and usually cancelled not long after the first few episodes due to failed ratings. I’m talking about the habit of US production companies taking British tv shows and films, and duplicating them, with all-American cast and bastardisation of the storyline. The ratio of UK tv shows ‘translated’ into US, vs the other way around – well. The figures speak for themselves. The majority of UK to US are fiction – sitcoms and speculative. The majority of US to UK are game shows, television that doesn’t rely on characters or storytelling. Figures aside – why do we, fans, take it as personal insult when a UK to US remake is announced? Think Shakespeare. Shakespeare’s plays travels around the globe, and different actors slip into the roles for each production. Each director instructs them a little differently. We can’t say, David Tennant was THE BEST Hamlet ever, now I’m going to hold a grudge whenever anyone plays him again. An actor is simply a vessel for a character. So why do we get so defensive when someone else plays a character we’ve liked a particular portrayal of? And this doesn’t even hold as a valid reason when you get a case like the IT Crowd (US remake cancelled prior to airing) – where they shipped Richard Ayoade (Moss) over to the US for their version. We can’t all make it to David Tennant’s Hamlet; plays are restricted to the locations they travel to. Television is an entirely different medium when it comes to audience reach. You can reach the entire world with a TV show. Nobody has to miss out the first time around. This is partly because of the timing, I believe. 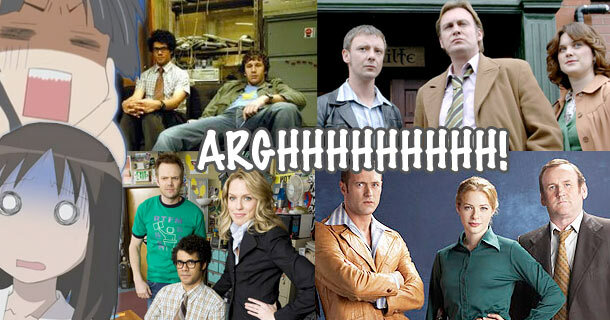 The remakes that cause the most heartache in squeedom are usually announced a year or two after the original has aired. It’s not as though in those few years that it’s script needs to be updated to suit a new generation. The show is already in English, so it’s not like they need to translate it. No matter the motive, it feels like a snub to the show, and thus to the fans, as though they’re saying ‘we know you put a lot of work into this – we know you love it, but no, we can do this better’. While researching this topic I’ve come across so many comments from Americans saying, “why do they keep doing this?”, whenever a US remake of a UK original is announced. As viewers and fans, they are finding and watching the original. They are liking the original. I know in entertainment-land, it’s assumed that Viewers are Morons, so they feel the need to white-out cultural references and substitute things like ‘jumper’ for ‘sweater’. But in reality? Americans have grown up on British shows, just like we in Australia and New Zealand and many other countries have. We get it. We know that they use different words for things, and that there are different countries in the world. So if there is no genuine need from the public to change it, who are the production companies making it for? Themselves? Fanfiction is usually a product of love for something though, not primarily arrogance, or to cash in, isn’t it? Although, I don’t see many fanfictions that say, hey, the original was good but I’m going to re-write the entire show / book / movie / game, using the characters the way I want them to behave and say what I want them to say. Stop right there. Scared? I am. My immediate reaction is one of horror, coupled with a smattering of anger. Then our reactions have nothing to do with the where, but the what that they’re remaking. We shared a journey with their characters. The series achieved it’s objective, told it’s story, and grew a loyal fanbase. To remake a show that got everything right first time around doesn’t just feel like a snub – it’s as though those production companies are saying our beliefs and loyalties are wrong. Perhaps those who make a habit of remaking perfectly good tv shows would be better off channeling their energies elsewhere. But they won’t; whatever the ramifications, they must get something positive from it or they wouldn’t continue to do it. It must be, or they wouldn’t keep selling shows! When it comes to the BBC – they survive on tv licenses, not advertising, right? When they sell the rights to a show, they’d make a tidy bit of cash. The remake existing creates interest in the original, and more DVDs are sold. So, what can we do? Clearly very little, to actually stop it – and as I said at the start of this – not all remakes are heathenous failures. But for those shows we feel burned about? As hard as it is to do when your loyalties are challenged, if the remake bombs, all we can do is standby the original. Grow it’s fanbase – and try forget the remake existed. Because while the supposedly greatest form of flattery is copying – when its copied badly, the greatest form of revenge isn’t anger – it’s lack of acknowledgment. Personally – I have been burned by the US remake of Life on Mars. And am very wary of the plans for a US version of Being Human. Which remakes – planned or aired – have you ARGH’d about?